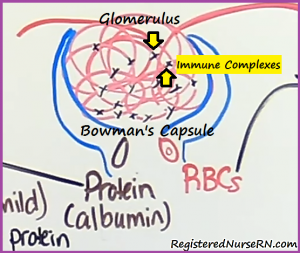 This NCLEX review will discuss acute glomerulonephritis (poststreptococcal). As a nursing student, you must be familiar with acute glomerulonephritis and how to care for patients who are experiencing this condition. Don’t forget to take the acute glomerulonephritis quiz. What is acute glomerulonephritis (poststreptococcal)? It is the inflammation of the filtering structure of the nephron (what is the filtering structure of the nephron? Glomerulus) that causes permeability to protein and red blood cells due to previous strep infection. Therefore, protein and red blood cells will be present in the urine. It tends to present 14 days after a strep infection of the throat or skin (impetigo). It mainly affects the pediatric population ages 2-10. Glomerulonephritis is an umbrella term for various types of kidney disorders where there is injury to the glomerulus and they can be nephritic or nephrotic. Poststreptococcal glomerulonephritis is a type of NEPHRITIC SYNDROME meaning there is the leakage of BOTH red blood cells and a mild amount of protein from the inflamed glomerulus. 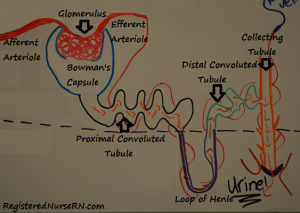 What is the nephron? the functional unit of the kidney that filters the blood (specifically the glomerulus with the assistance of Bowman’s capsule) and reabsorbs and secretes substances taken from the filtrate/blood with the help of the renal tubule and peritubular capillaries . What is happening in Poststreptococcal Glomerulonephritis? The glomerulus becomes inflamed due to a recent infection from a group of bacteria called streptococcus. The bacteria itself doesn’t cause the inflammation to the glomerulus but the immune system which has created immune complexes. These complexes become stuck in the glomeruli which leads to inflammation and permeability of PROTEINS (albumin) and RED BLOOD CELLS. What happens when there is a low amount of protein the blood? Swelling in the interstitial tissue…hence EDEMA. 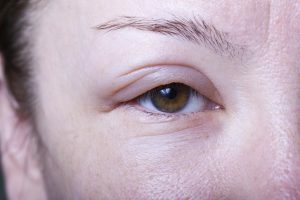 The swelling mainly presents in the face/eyes and will be mild. Why mild swelling? Within the capillaries are a protein called albumin that regulates oncotic pressure. Albumin creates oncotic pressure by controlling how much water stays within the capillaries. Capillaries have fenestrations (pores) that allow water and other substance to flow out of the capillaries into the interstitial tissue. Hydrostatic pressure (controlled by the blood pressure) regulates the flow of substances out of the capillaries but oncotic pressure regulates the amount of water that leaves the capillaries. When the glomerulus filters proteins into the urine the patient experiences PROTEINURIA which decreases the amount of protein/albumin in the blood. Therefore, when low amounts of albumin are left in the blood, the water will leave the capillaries’ fenestrations and leak into the tissues. This is because the protein albumin isn’t there to control the water. Therefore, it leaks into the interstitial tissue. Decrease glomerular filtration rate (GFR): What is GFR? It is the flow rate of filtered fluids through the kidneys, specifically the glomerulus. Why does the GFR decrease? Inflammation of the glomerulus leads to other immune cells to present at the site of inflammation. The site becomes congested. Therefore, the glomerulus isn’t able to filter the blood normally. Due to this, waste in the blood build-ups (remember the kidneys are NOT filtering normally) and this increases the blood urea nitrogen (BUN) and creatinine levels. Daily weights (weight gain is the earliest sign of fluid retention): use same standing scale every day. Try to avoid bed scale if possible…standing scales are the best. Since the disorder mainly affects the pediatric population remember these patients should void 1mL/kg/hr. Assess color of urine…is the urine starting to look normal? “Glomerular Diseases | NIDDK”. National Institute of Diabetes and Digestive and Kidney Diseases. N.p., 2014. Web. 5 June 2017. “Group A Strep | Post-Streptococcal Glomerulonephritis | | PSGN | GAS | CDC”. Cdc.gov. N.p., 2016. Web. 5 June 2017.